SAVE 20% on Top-Quality Angeles® Items! Park your trike, get up from that cot, grab a chair and head over to Discount School Supply for 20% OFF dozens of Angeles® items right now! Teachers, parents, caregivers and early childhood educators: save big bucks on tricycles, cots, chairs, tables, buggies and more Angeles® products for a limited time. These amazing deals will only last until June 15th so shop Discount School Supply today! 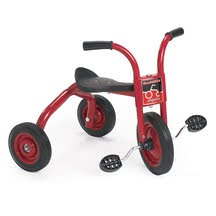 10" ClassicRider® Trike for ONLY $79.96! Angeles® trikes have set the standard in quality for over 50 years! Timeless design and durability with a new red powder-coated frame. The ClassicRider® features comfort back support; heavy duty, rubber handgrips; durable welded steel frame; long lasting, self-lubricating nylon bearings; one-piece welded crank; solid rubber tires on spokeless steel wheels and a 5-year warranty. 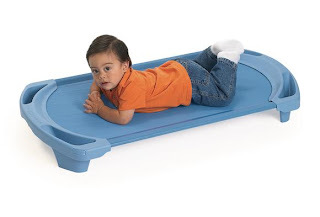 Angeles® SpaceLine® Single Toddler Cot for ONLY $23.96! These top-rated cots feature fully enclosed ends and use half the space to store. The fabric never needs tightening, the cot ships fully assembled and a 10-year warranty is included! Purchase individually or as a set of 5. And choose your color: Slate Blue, Teal Green, Ocean Blue and Wedgewood Blue. 7" BaseLine® Chair for ONLY $19.96! Manufactured by Angeles®, these chairs are so lightweight even the youngest of kids can handle with ease! Stackable, easy-to-clean chairs have a molded plastic shell and PVC legs. Leg boots reduce noise and prevent rust. 5-year warranty. 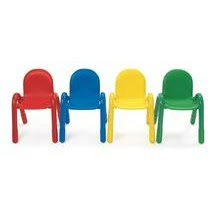 Chairs are available in Royal Blue, Candy Apple Red, Canary Yellow, Shamrock Green, Sunshine Yellow, Teal Green, Slate Blue, Natural, Ocean Blue and Coral Red. Find more deals on Angeles® cots, chairs, tables, buggies, trikes and more when you shop Discount School Supply today. But you must hurry! This sale ends June 15th! 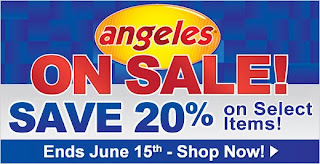 So click here right now to take advantage of the 20% savings on select top-quality Angeles® products. And don't forget: Discount School Supply is the place to shop for classroom educational materials for early learners. With everyday savings on Furniture, Curriculum Resources, Active Play, Dramatic Play, Arts & Crafts, Manipulatives and more, you won't find better deals anywhere! Smart shoppers know that Discount School Supply offers the 110% Lowest Price Guarantee. Find terrific savings on early education supplies from Discount School Supply right here! Looking for an alternative to smearing sticky glue with fingers? Discount School Supply has the solution: Colorations® Glue Jar with Brush - Set of 12! You'll keep your hands and your work area clean with these convenient glue jars. The application brushes are attached to the inside of their caps, making gluing a breeze and cleanup a snap. We were really struggling to find a way to have our class of 2.5-5 year olds use glue for their projects, especially since they have fallen in love with making picture collages. This glue bottle is the best! We tried everything and it would either break, dry out, encourage over use or ruin our paint brushes. All of our kids can use these! They took away the task of cleaning up a tray and brushes and they are so easy to grab and quickly put on the table. We will continue to buy these anytime we need more and would definitely recommend them to anyone! Find Colorations® Glue Jar with Brush - Set of 12 at Discount School Supply right now. The reusable jars are sold empty in a set of 12 and hold 2.7 oz. each. Jars measure 2 5/8"H x 2"Dia; cap is 1 1/4"W x 2 1/2"L.
Get Ready for Summer with Extreme Bargains! Summer is just around the corner. Did you set up the barbecue? Did you clean out your storage space? Did you shop at Discount School Supply for year end savings? Why get ready for summer by shopping at Discount School Supply? Extreme Bargains and FREE shipping on in-stock orders of $49 or more, only for a limited time, that's why! Right now, you can save a bundle during our End of School Year Extreme Bargains Sale. 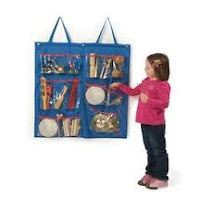 Save 50% or more on hundreds of early childhood education items. Better yet, get FREE delivery on all in-stock orders over $49 when you use code 49FREE with your order. What a sizzlin' deal! But you have to act now. Summer is almost here and this deal ends May 31st! 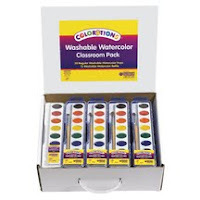 Colorations® Washable Watercolor Classroom Pack - 28 Sets ONLY $39.99! Handy durable cardboard pack provides a perfect storage solution for all your classroom watercolor trays and refills. Non-toxic and AP Certified. 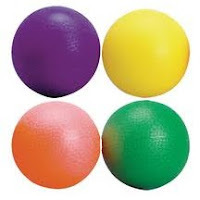 Best Value Playground Balls - Set of 4 ONLY $10.95! These beautiful, bright balls are made of tough PVC with a textured surface for extra durability. 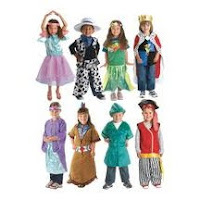 Make Believe Costumes - Set of 8 ONLY $139.99! Bring imagination to life with Discount School Supply's exclusive make-believe costumes. Set of 8 includes: ballerina, cowboy, mermaid, king, princess, Native American girl, woodsman, and buccaneer - a make-believe world of possibilities! And these are just some of the hottest deals Discount School Supply has to get ready for summer. Click here for more! Discount School Supply is the place to shop for early childhood learning materials for home and the classroom. Shop Discount School Supply and find everyday savings on Arts and Crafts, Furniture, Manipulatives, Curriculum Resources, Active/Dramatic Play and more. Save more right now during our Extreme Bargains and be sure to use code 49FREE to get FREE delivery on in-stock orders over $49. Click here for more information. Don't forget: this deal ends May 31st so get shopping right now! Can you get both quality and quantity? In today's day and age, it seems that if you want quality then you have to sacrifice quantity and vice versa. $20 at your local dollar store will get you a ton of stuff, but much of it might not last very long. $20 at your local high-end retailer won't get you much, but the quality should justify the price, right? Isn't that the way it goes everywhere you shop? Not at Discount School Supply! Discount School Supply proves you don't have to sacrifice quality for quantity. And that proof starts with Colorations®, the exclusive brand of Arts and Crafts from Discount School Supply . 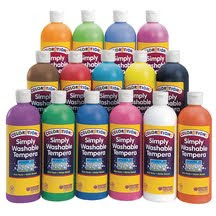 Colorations® Simply Washable Tempera Paints, 16 oz. - Set of 15 ONLY $25.35! This top-rated product is a customer favorite. Colorations® Simply Washable Tempera offers the lowest price and best quality on tempera paint - guaranteed! Its smooth, rich consistency, matte finish and opaque coverage make this ultra-washable paint the smart choice for classroom projects. 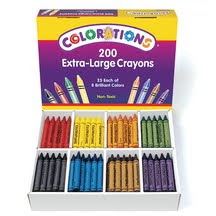 Colorations® Extra Large Crayons - Set of 200 ONLY $26.99! These beautiful, bright crayons offer exceptional quality for such an incredibly low price. Set includes 25 each of the classic colors. With a customer rating of five out of five stars, this is another top-rated product! 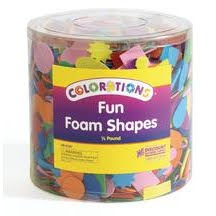 Colorations® Fun Foam Shapes in a Bucket - 1/2 lb. ONLY $6.99! Also a customer favorite, these plain and fancy foam shapes in assorted colors are ideal for classroom art projects. Better yet, many Colorations® products are free of common allergens like latex, dairy, casein, egg, gluten, peanut, tree nut or soy (see specific product for exact details). Still not convinced that you can get both quality and quantity with the Colorations® brand from Discount School Supply? Click right here to see more customer favorites that might change your mind. Moms, dads, teachers and caregivers: shop Discount School Supply for all your early childhood education needs. Find both quality and quantity in Arts and Crafts, Furniture, Manipulatives, Curriculum Resources, Active/Dramatic Play and more. Click here to find out more! The dollar store and high-end retailers might force you to sacrifice either quality or quantity, but at Discount School Supply you'll get both! Get more quality and more quantity with Colorations® and other everyday savings at Discount School Supply. If there is no "budge" to your budget then now is the time to shop Discount School Supply for your Arts and Crafts supplies. 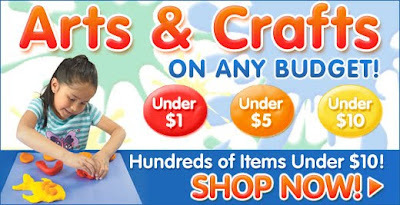 Right now, find hundreds of Arts and Crafts items under $10 at Discount School Supply! There are even budget-friendly deals under $5 and some under $1! 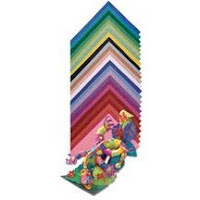 9" x 12" Colorations® Heavyweight Construction Paper ONLY $0.95! Combining bright color and a smooth uniform finish with state of the art technology, Colorations® constructon paper offers great performance and appearance at a value price. Ideally suited for arts and crafts, this heavyweight construction paper cuts clean and folds evenly. Recyclable paper is environmentally friendly and the pulping process is chemical free. Find more Arts and Crafts under $1 right here! 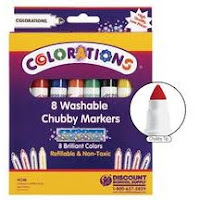 Colorations® Super Washable Chubby Markers - Set of 8 ONLY $2.99! These markers hold 4.2 grams of SUPER washable ink. Sturdy, nylon, conical tips are pointed for making both fine lines and filling large coloring spaces. Find more Arts and Crafts under $5 right here! 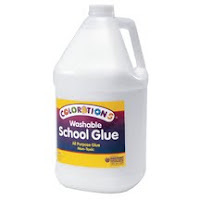 Colorations® Washable School Glue, Gallon ONLY $6.99! This glue adheres to paper, wood, fabric and other porous and semi-porous surfaces. It is completely non-toxic and easily washes off skin, most clothing and other surfaces with soap and water. Find more Arts and Crafts under $10 right here! Budget-friendly deals are just a click away. Visit Discount School Supply today and find Arts and Crafts under $10, $5 and $1! And be sure to check out all of the other terrific deals on Furniture, Manipulatives, Active Play, Dramatic Play, Curriculum Resources and more. Moms, dads, teachers and caregivers: if your budget won't "budge" then do your early childhood product shopping at Discount School Supply, the most budget-friendly place today! What's a Phrase that Means SAVINGS? What's a 20-letter phrase that means "savings"? Here's a hint: there are two Ps, two Us and three Os... Give up? Discount School Supply! Those 20 letters, when combined together, mean SAVINGS! Aren't word games fun for all ages? Language learning and forming words are an essential part of early childhood brain development. 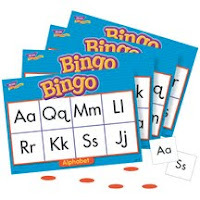 Alphabet Bingo Game ONLY $9.49! This game contains 36 different playing cards, caller's mat and cards, 250 markers and a sturdy storage box. For 3-36 players. ABC Learning Mat - 36 Pieces ONLY $29.99! 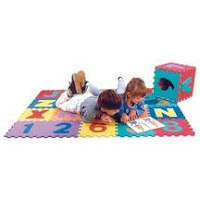 These large foam mats are non-toxic, safe, soft and washable. 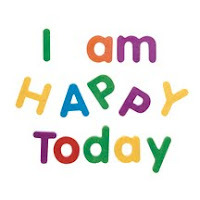 The colorful 1' square pieces have removable letters and numbers. The 1/2" thick pieces interlink with each other to create a puzzle, cubes or a giant floor mat. Giant Foam Magnetic Letters - 144 Pieces ONLY $19.95! These thick foam letters and numbers are easy to use with a magnetic board. 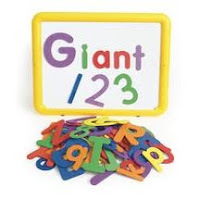 114 giant foam magnetic pieces include: 52 each uppercase (approximately 5"H x 4"W) and lowercase letters (approximately 2-1/2"H x 3-1/2"W) and numbers 0-9. Moms, dads, teachers and caregivers: click here to find more Language resources on sale right now at Discount School Supply that will help lay the foundation for your little wordsmiths to become exceptional writers and garrulous orators! While at Discount School Supply, be sure to check out the everyday savings on Furniture, Manipulatives, Arts and Crafts, Active Play, Dramatic Play, Curriculum Resources and more great stuff for the early childhood learning environment. And next time you work on a crossword, don't forget that a 20-letter phrase for savings is Discount School Supply! Did you hear the news? It's New Deals time at Discount School Supply! Right now brand NEW Discount School Supply products are on sale! Colorations® School Glue Pens - Set of 12 ONLY $4.99! Same great glue as our Colorations® Washable School Glue! 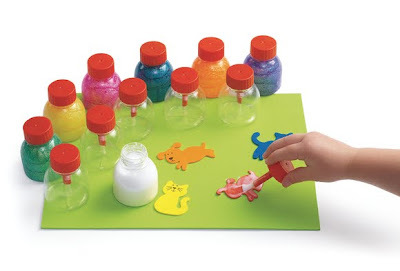 Easy for young children to manipulate and the glue flows easily through the rounded applicator tip. Ideal for gluing projects and adheres to all types of paper, wood, fabric, feathers and foam. Build A Healthy Plate - 28 Pieces ONLY $29.99! This chart will teach children to categorize foods, make wise choices and, in turn, build a healthy plate! Ideal for teaching children nutrition and how to eat healthy foods. Foam Unit Floor Blocks - 126 Pieces ONLY $99.99! Use these brightly colored blocks for building on the floor with full-sized floor unit blocks. Exclusively available at Discount School Supply! Parents, teachers and caregivers: find more new deals when you shop Discount School Supply. Check out our new deals for affordable classroom learning materials that are easy on your budget! So shop Discount School Supply today for over 300 new items and be sure to check out the everyday savings on Furniture, Curriculum Resources, Arts and Crafts, Active Play, Dramatic Play and more. Click here for more new products and new deals! Ladies and gentlemen, Discount School Supply is proud to announce tonight's performance of "Symphony in A Major... Savings," so please take your seats. This evening's performance will be led by Rhythm Sticks - 10". 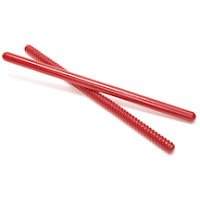 For ONLY $1.79, these wooden sticks include one fluted and one plain for optimal orchestra accompaniment. On the glockenspiel, please welcome the 8 Note Glockenspiel with Mallets. 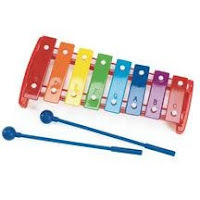 For ONLY $16.65, this unique set has letters on each colored bar to help young children learn musical notes. Our rhythm section features the Rhythm Band. 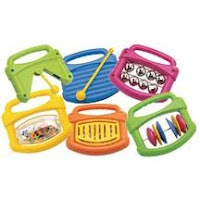 ONLY $32.95, this unique set of 6 complementary instruments is designed to lead children from their first discovery of noise and sounds into the creative world of making music. 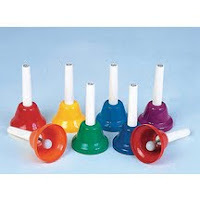 Our featured performer is the KIDSPLAY® 8-Note Handbell Set ONLY $45.95! 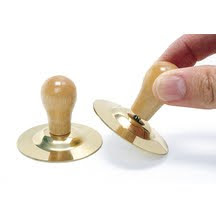 Top-quality construction and improved intonation make this 8-Note Handbell Set the best value available. Organizing all of our performers is the Instrument Organizer with 14 Pockets. Create a music center in a small space for ONLY $16.99. 14 pockets hang from sturdy straps or grommets. Teachers, caregivers, moms and dads: prepare to be wowed by the Discount School Supply symphony of savings! And after the performance, visit Discount School Supply for an encore of savings on Arts and Crafts, Furniture, Active Play, Dramatic Play, Curriculum Resources and more. So let's get on with the performance! Click here to see our show of valuable savings! Great quality products at the lowest guaranteed prices is music to everyone's ears! Have you thanked a teacher today? It is National Teacher Appreciation Day, after all. In fact, this entire week is National Teacher Appreciation Week! Discount School Supply celebrates teachers every day with budget-boosting deals on quality early education classroom materials for Arts and Crafts, Dramatic Play, Active Play, Curriculum Resources, Furniture, Manipulatives and more. But during Teacher Appreciation Week, Discount School Supply savings get even bigger! That's right, shop Discount School Supply right now for an EXTRA 20% OFF top-rated Teacher's Favorites. 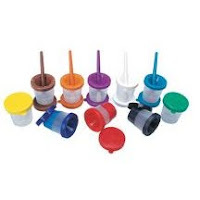 Colorations® Air-Tight, No-Mess Paint Cups - Set of 10 ONLY $5.19! These durable clear plastic cups are designed with a tapering hole on the inner lid, especially designed to prevent spills. The outer lid is airtight to preserve paint. Rainbow Number Ring Counter ONLY $7.99! Match the rings to the peg. Stimulate logic and become familiar with numbers and counting. Foam Tabletop Unit Blocks - 68 Pieces ONLY $23.96! 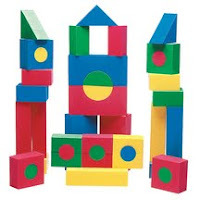 Safe, colorful, soft building blocks made of foam rubber. Cut with perfect edges for easy stacking and building. Moms, dads, teachers and caregivers: find more savings on Teacher's Favorites when you click on Discount School Supply. But you have to act now! This sale ends May 10th! The sale may be over soon, but teacher appreciation at Discount School Supply will never wane. Discount School Supply is all about providing top quality classroom materials for any budget! Teachers save time and money when shopping online at Discount School Supply which gives them more time to inspire our little learners! As William Arthur Ward once stated, "The mediocre teacher tells. The good teacher explains. The superior teacher demonstrates. The great teacher inspires." And the savvy teacher shops Discount School Supply during our Teacher Appreciation Week sale!